This replica watch is made by VS factory, which is also known as KW or V6. 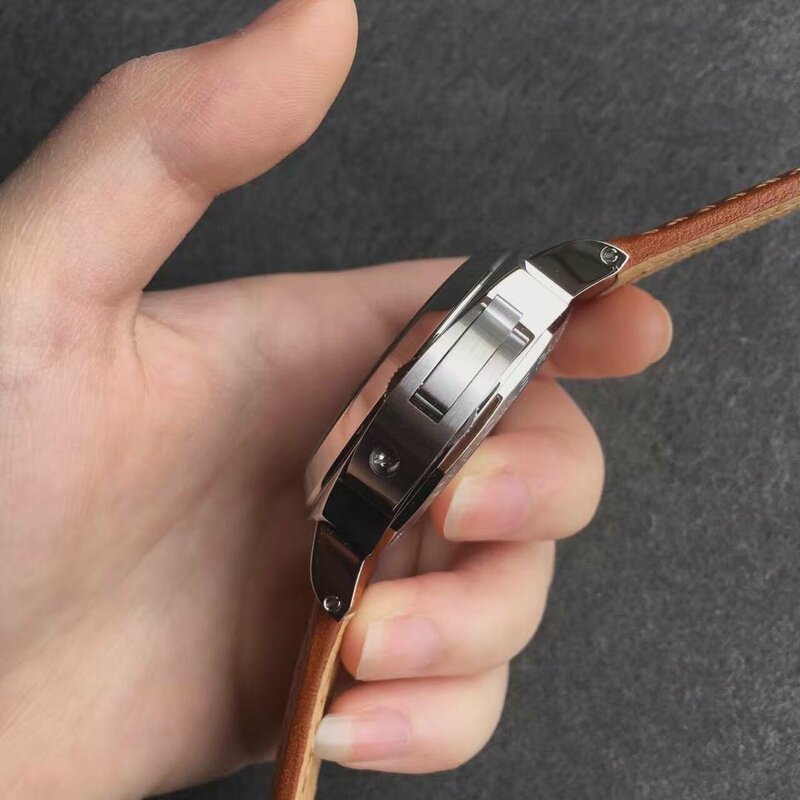 The watch has a classic design only with two hands, the small second hand is on the subdial at 9 o’clock, date window is positioned at 3 o’clock, main dial is in dark brown color with stick hour markers. 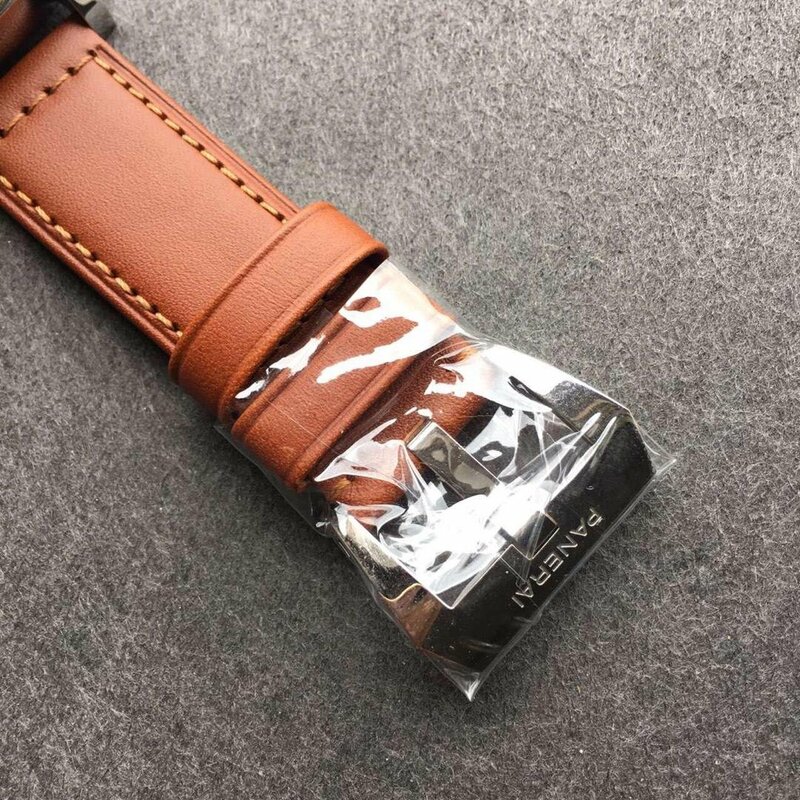 Like genuine watch, there is “L SWISS MADE L” printings, the replica is not made of stainless steel, but Titanium, so it looks a little grey in color. Sapphire crystal is domed, not flat, the crystal features a colorless ar coating, this is the same as genuine. 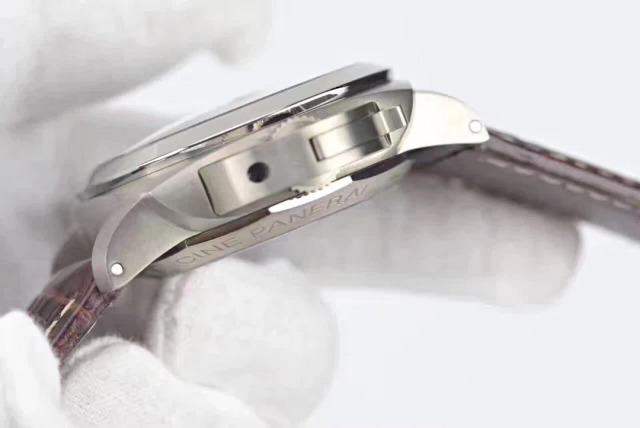 Titanium case has a refined brushing process, while the bezel is polished. People who are allergy to stainless steel can choose this Titanium watch. The case profile and construction are also the same as original. Now, I am going to introduce the most important part of the watch, yes, the movement. 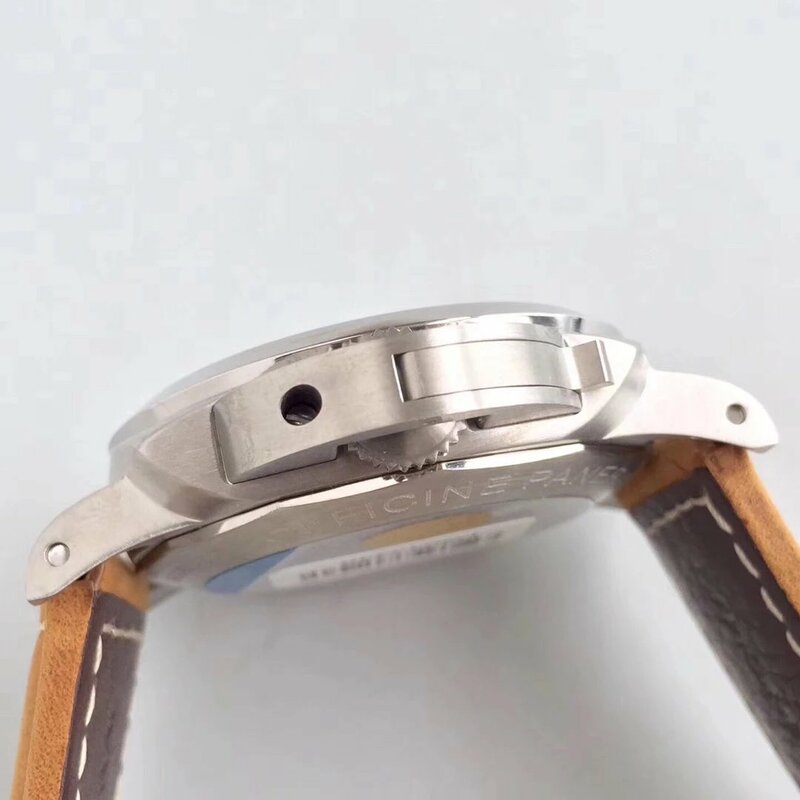 The PAM 351 replica uses a see-through sapphire crystal case back, some people who want to buy this watch but have a worry about this, because they are afraid of being spotted as wearing a replica watch by checking the movement through the crystal back. 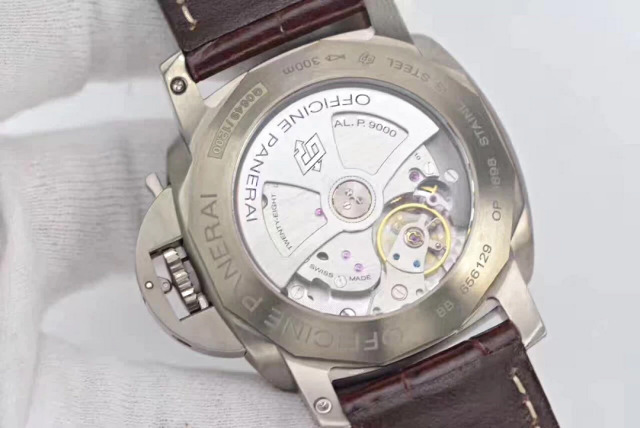 However, on this replica, you do not need to worry because VS has replicated the P.9000 so perfect, the movement has correct decoration like PANERAI SEALs, the position of balance wheel is also corrected, so even you check the movement through case back, you can not find the its difference with the genuine. 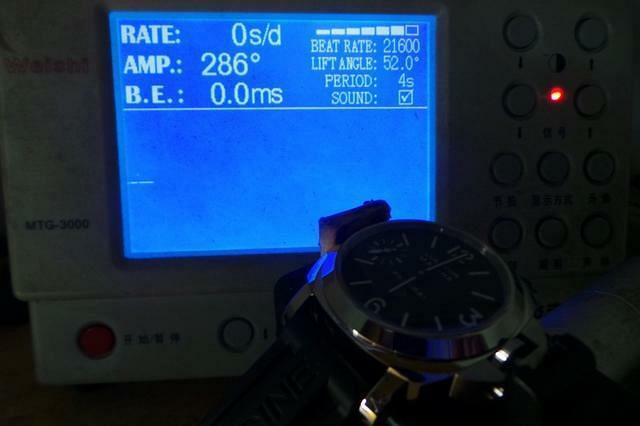 In the past, most factories used Shanghai 7750 or Sea-gull ST25 as a basic movement to clone Panerai P.9000, however, this Super Clone P.9000 is modified from a Japanese Seiko automatic movement, VS made a modification on its gears, so this clone P.9000 has the same date adjustment and winding as genuine Panerai P.9000. The dial lume is super, maybe much stronger than the lume of genuine watch. The blue dial lume is also durable because VS uses imported Swiss SuperlumiNova C3 on this sandwiched dial and hands. 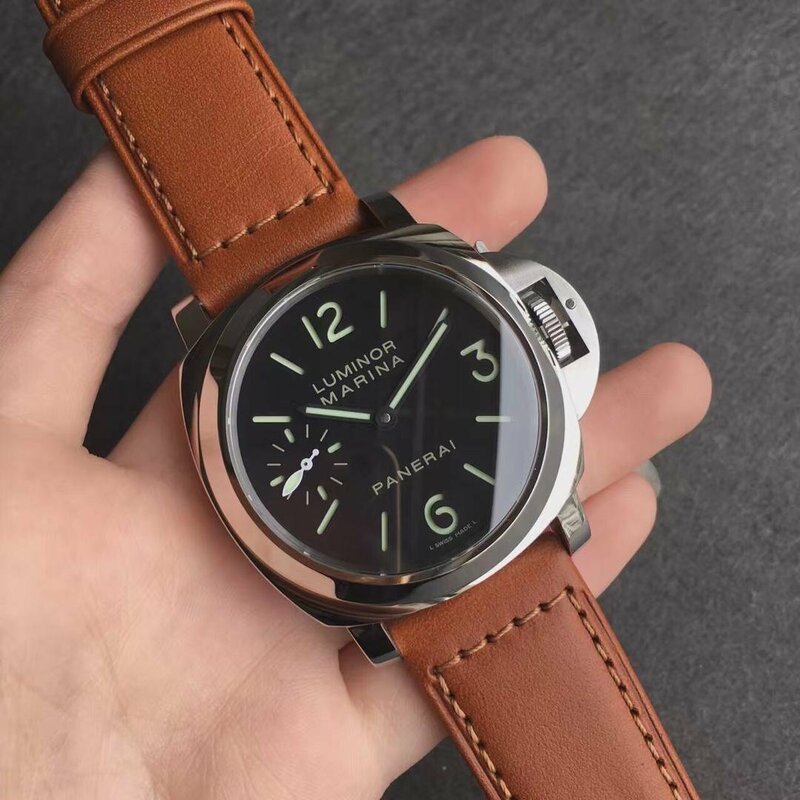 Brown leather strap is made of genuine calf skin leather, there is white hand stitching, the Pre-V buckle is a classic feature of Panerai Luminor watch, it is brushed with “PANERAI” deeply engraved. The band is very soft and comfortable to wear. As an entry-level Panerai watch, this PAM 351 replica watch can fulfill your basic requirement in your daily life. 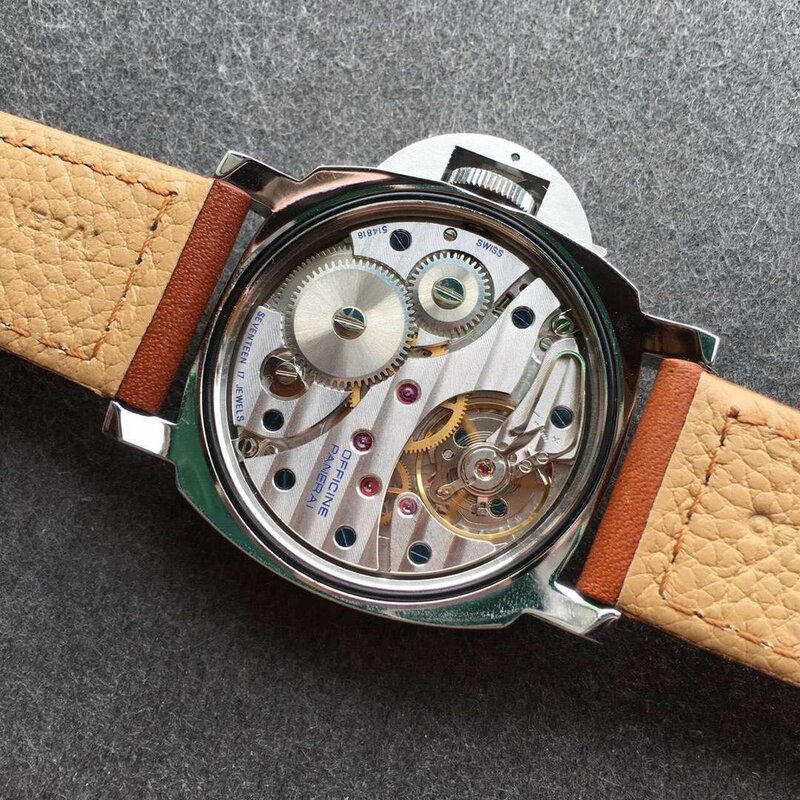 With a self-developed clone P.9000 movement that has been tested for years, the replica watch can work accurately and stably. The brown leather strap makes it look a little luxury, under its sporty appearance, PAM 351 is also an ideal choice for being worn as a dress watch. 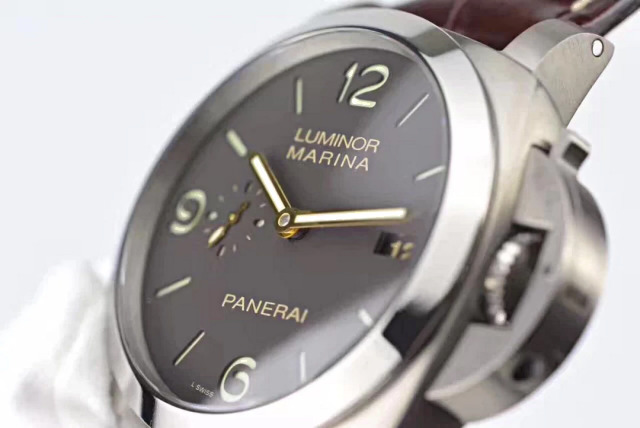 Each year Panerai added new models to their Luminor and Radiomir collection, in the latest PAMs they have published in recent years, Panerai used more innovative materials like carbon fiber and bronze. 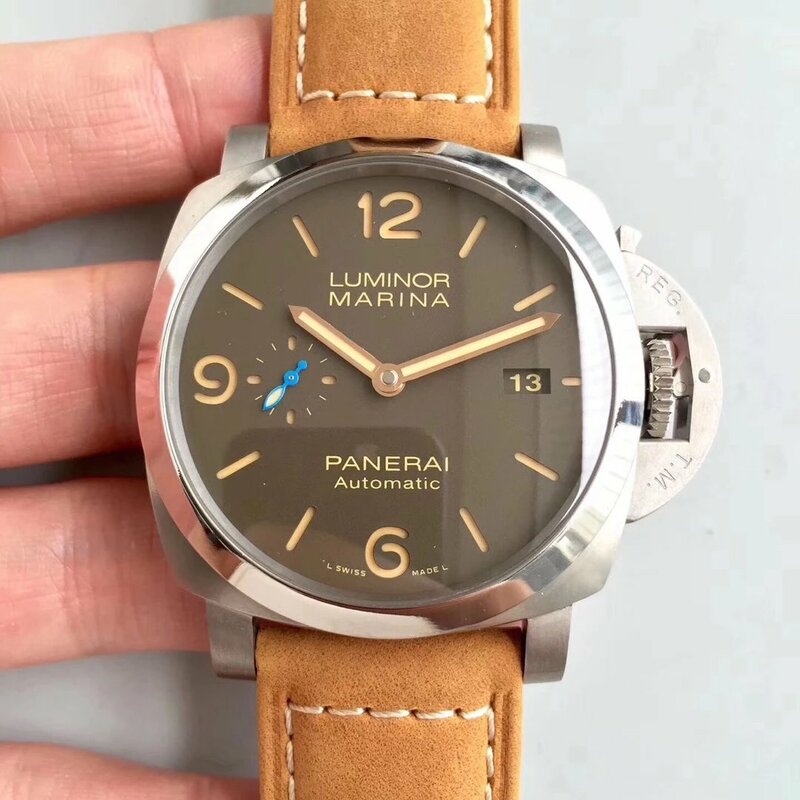 While I do not like the way they use blue, green and other color on their dial, that’s the reason why I always love PAMs published in old times, because they inherited the classic features of Panerai and offer a variety of band options for watch fans who want to place the watch for fun. 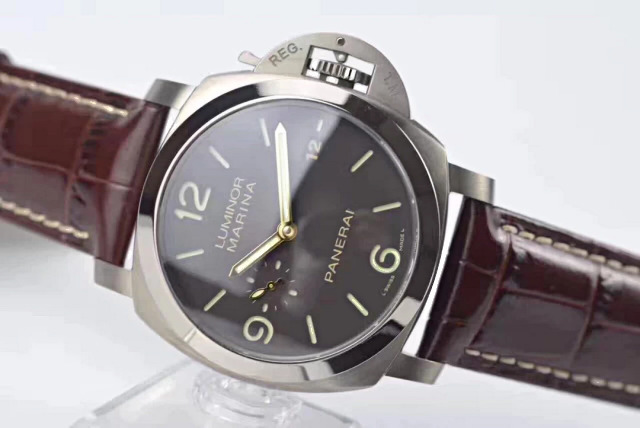 Panerai watches today look more modern and are equipped with more high-tech movement developed by Panerai itself, however, these new models are loosing some flavor that has been kept by Panerai for a lot years. 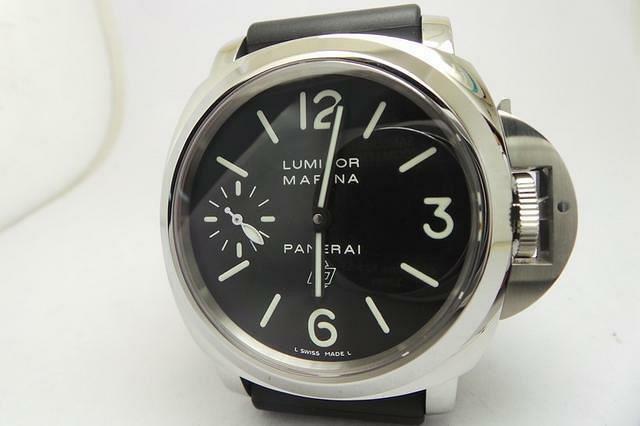 Only some Luminor Submersible has this flavor that is the core spirit of this brand made for the Italian Navy. 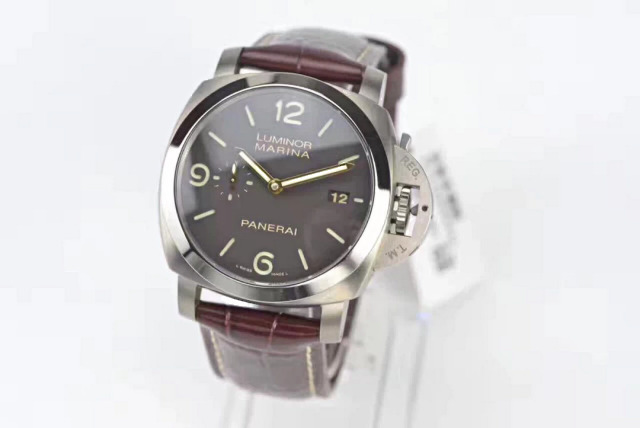 Today, I am going to introduce a new replica Panerai here, it is PAM 1351 made by Z factory, here we call it ZF. Yes, you notice its small blue hand on the left subdial, but I do not like it. 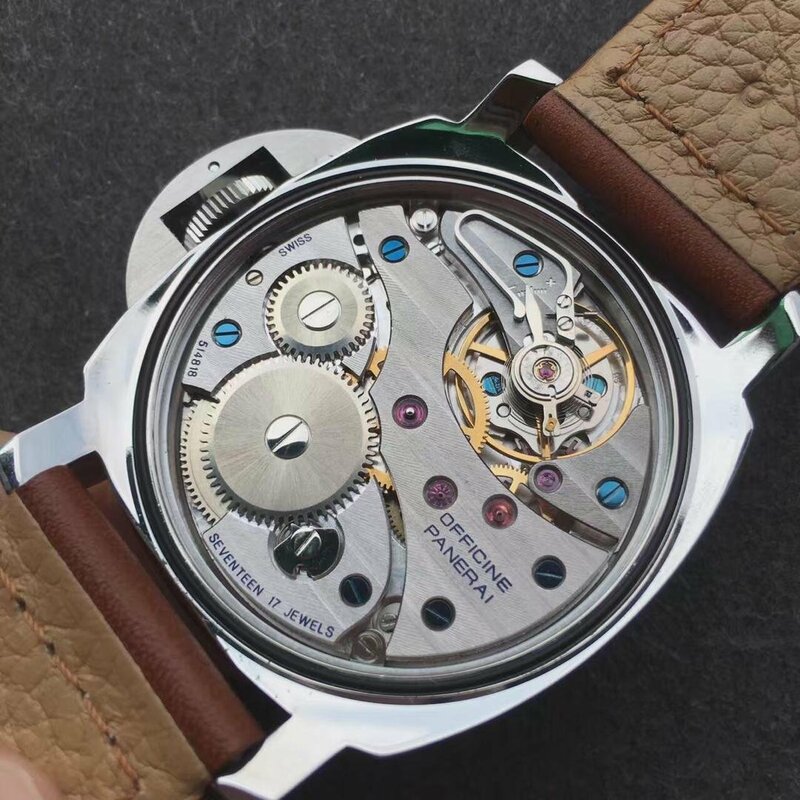 It is a PAM that features a see-through case back, yes, the biggest feature lies in its movement, which is a super clone P.9010. ZF makes the best P series clone movements because the rubies on movement plates are closest to genuine. 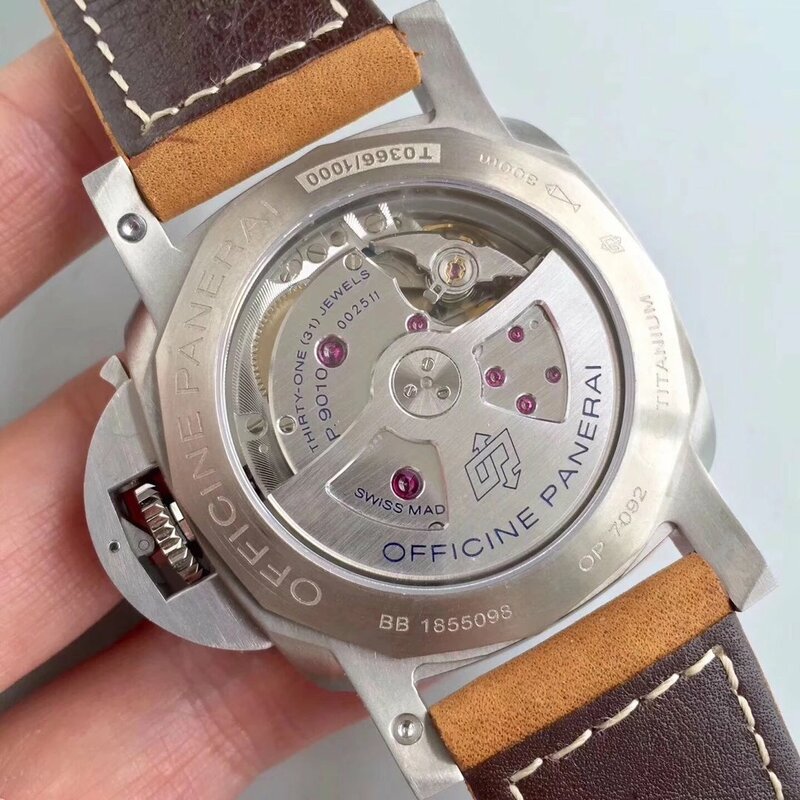 The movement has all correct blue engravings on such as “OP LOGO”, “OFFICINE PANERAI”, etc. There screws on the center are fixing the auto rotor to the main place, this design makes the movement work more stable. 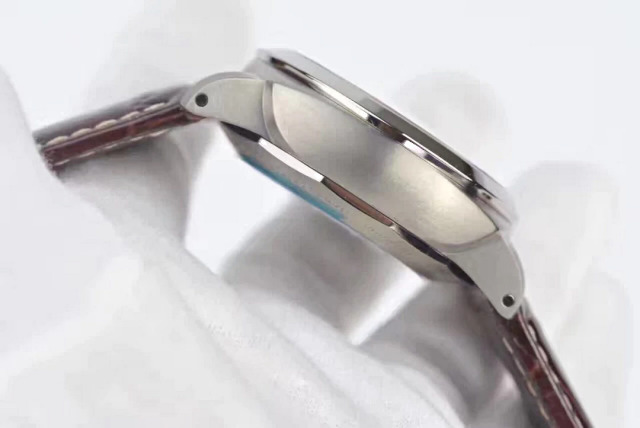 The case material is high tech, it is Titanium, but I do not like its processing way, have you noticed the brushing on case and polishing on bezel, the watch will look more attractive if Panerai also uses brushing on the bezel. 44mm is acceptable for most people who love big watches in current watch trend. Tabacco brown dial is eye-catching, as well as the blue second hand in small dial at 9 o’clock. To match the tabacco brown dial, the luminous material applied on the plate below the dial is in brown, not in patina like most other PAMs. 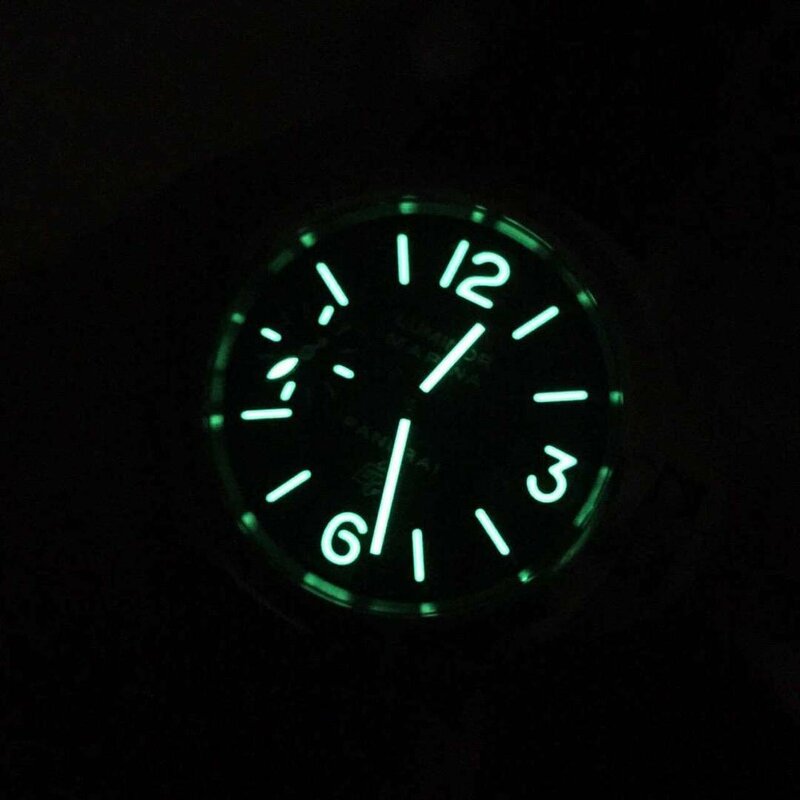 The dial will give the wearer a strong green lume at night. Besides the movement, the second place I love about this Panerai is its brown asso leather strap with pre-v buckle. If the band was in a darker brown like the dial color, I think the watch will become more attractive to you guys. 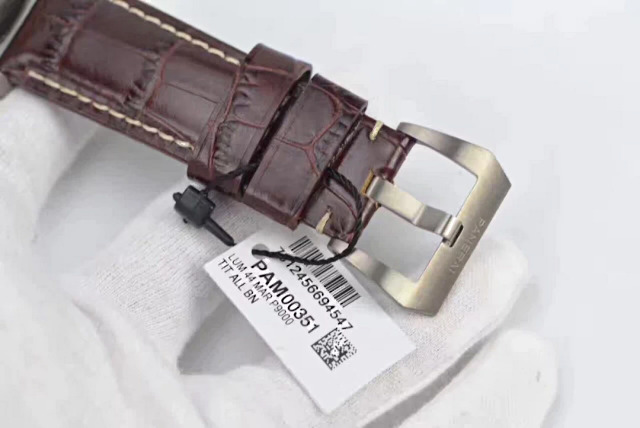 Now, this is the end of the replica PAM 1351 review, please leave your opinion if you are interested in any of those. 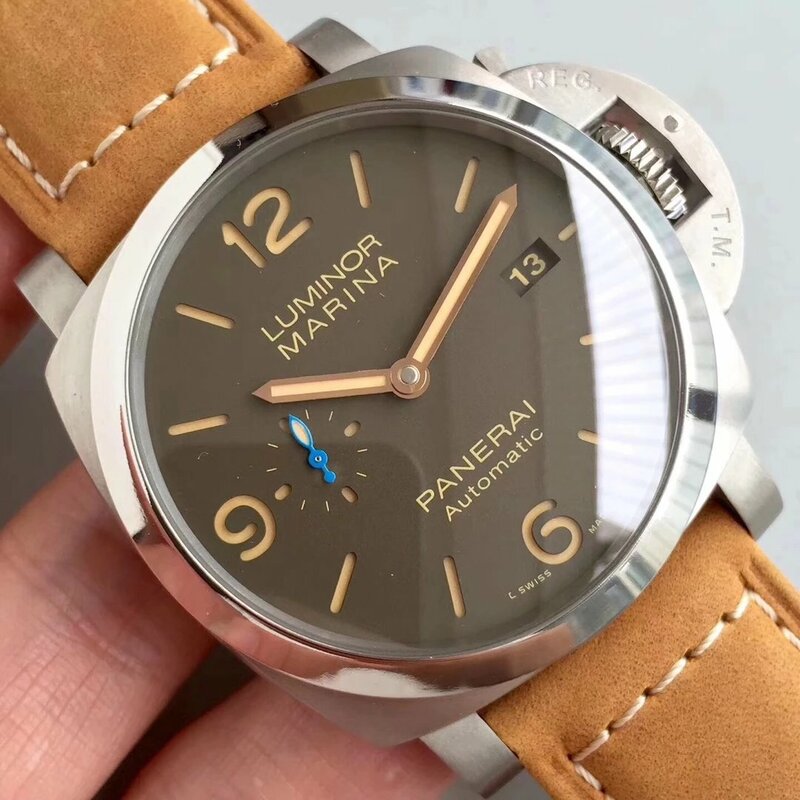 PAM 111 is the oldest Panerai that was replicated by Noob factory, it is also the first batch of 1:1 Panerai replicas in the market. 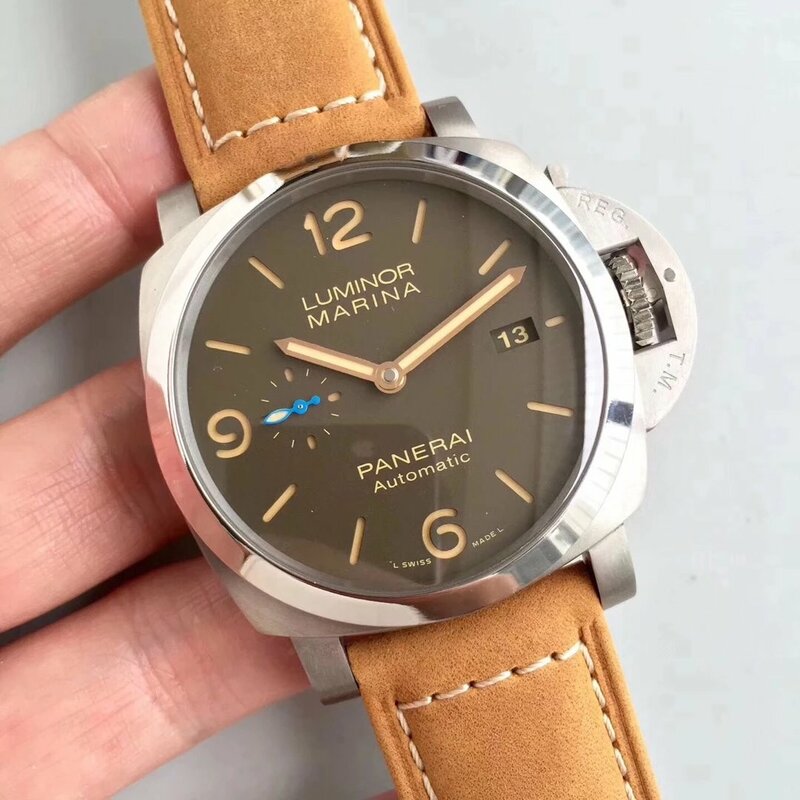 At that time, PAM 005 and PAM 111 were mainly manufactured by two factories, Noob and H. Absolutely the best one is made by Noob. PAM 111 replica hs been improved several times, now the versions we call is V4. 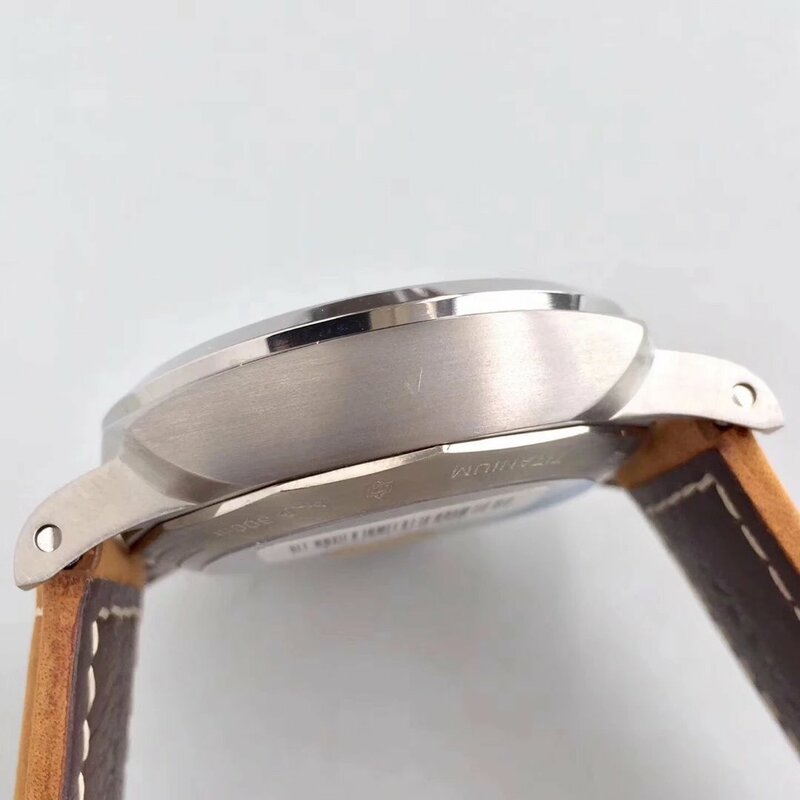 Among all those versions published before, although the appearance is more and more closer to genuine watch, their movement still used a clone ETA 6497, which is actually based on Sea-Gull 6497. However, it is very fortunate for us that Noob factory ordered hundreds of genuine ETA 6497 movements from abroad, and they installed in their legendary PAM 111. So, the PAM 111 I am going to introduce today has a big difference with its previous versions, that is this one is equipped with a genuine Swiss ETA movement. 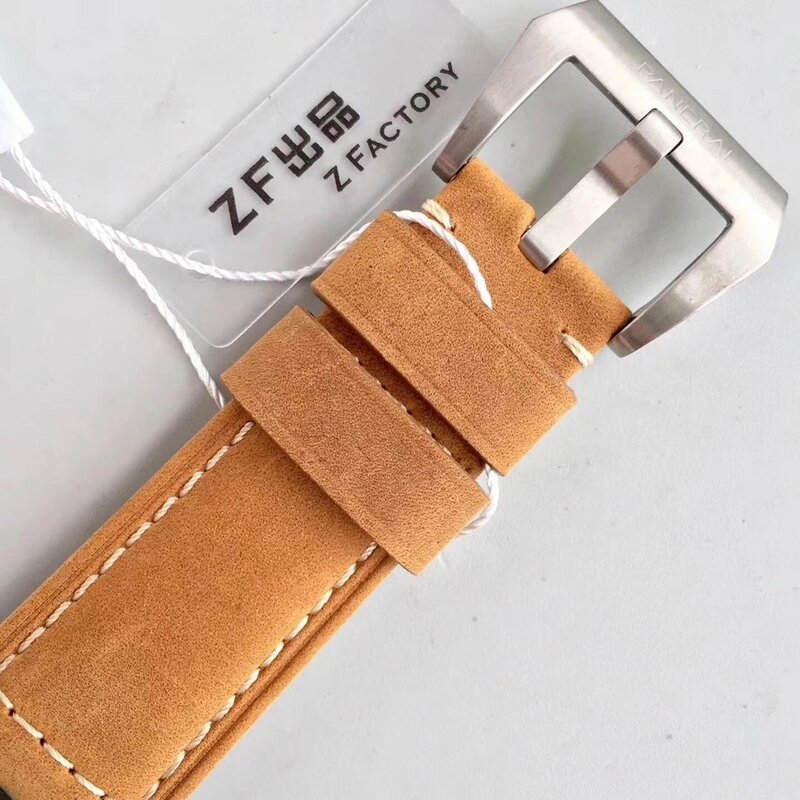 So, from outer to inner side, the watch can be said is a completely 1:1 replica. Fake watches business has been developped for many years, so for PAM 111 with such a simple appearance design, it is not difficult for the factory to replicate it to be 100% the same as genuine, after all, the replica has been modified several times, each modification was made on the basis of customers’ reviews, so for PAM 111, I can say it is the replica that is closest to genuine watch. This also has confirmed the truth, which is more simple the watch is, the less difficult the replication will be. How simple PAM 111 is? The dial tells you everyting. Two hands in the center, a small second hand is running on the subdial at 9, the dial is a classic sandwiched structure, with 3, 6 and 12 Arabic hour markers, besides time displaying, you can not find any other functions on the dial. The dial does not have too many complicated details, so the factory could focus on every detail and make them the best. 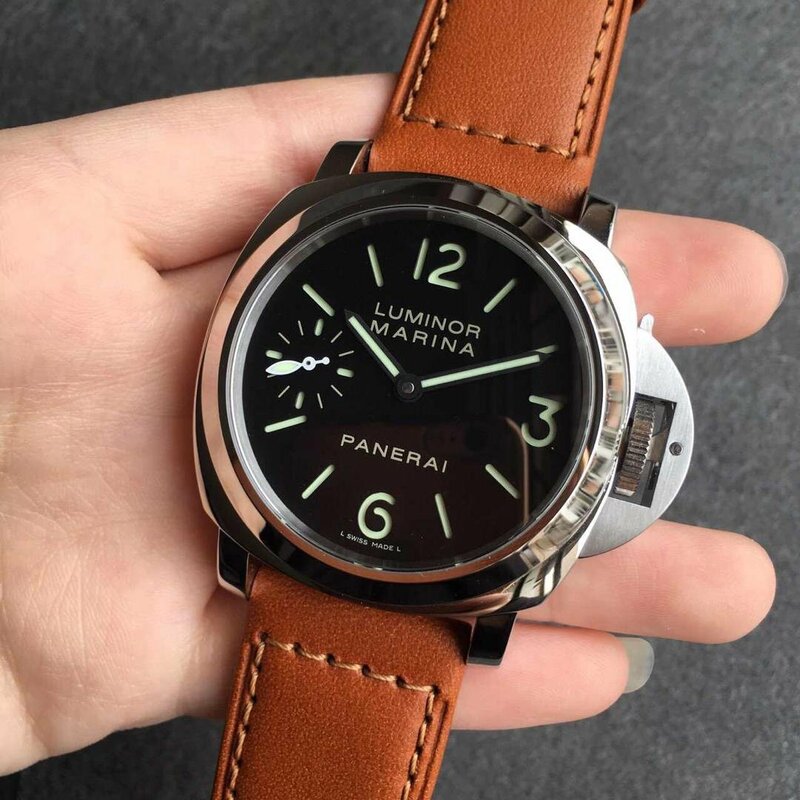 In addition, the replica has applied original Super-LumiNova material on hands and markers, so you will find the light emitting from the dial is strong and long lasting. The movement is genuine ETA 6497, you can find genuine movement photos and put them together to compare. The jewels color, swan neck shape and shock absorber are all the same as genuine 6497. The case back is see-through crystal, the movement is under your eyes, so I won’t use a false 6497 to deceive you guys. 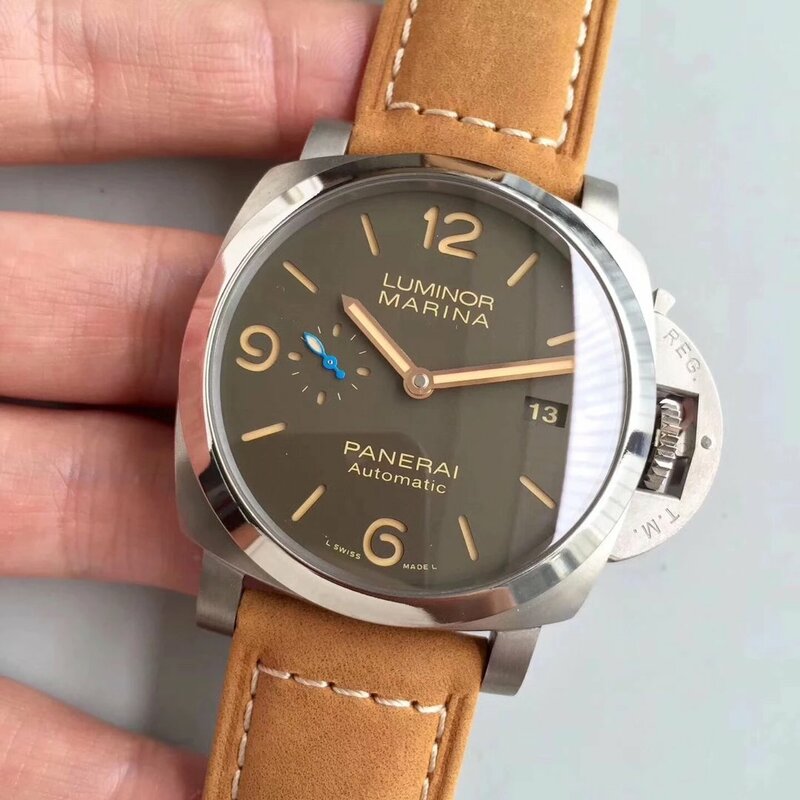 About the Panerai Luminor Marina 111 replica, besides the genuine leather brown leather strap that uses imported Italian calf skin, it also has a black rubber band option. 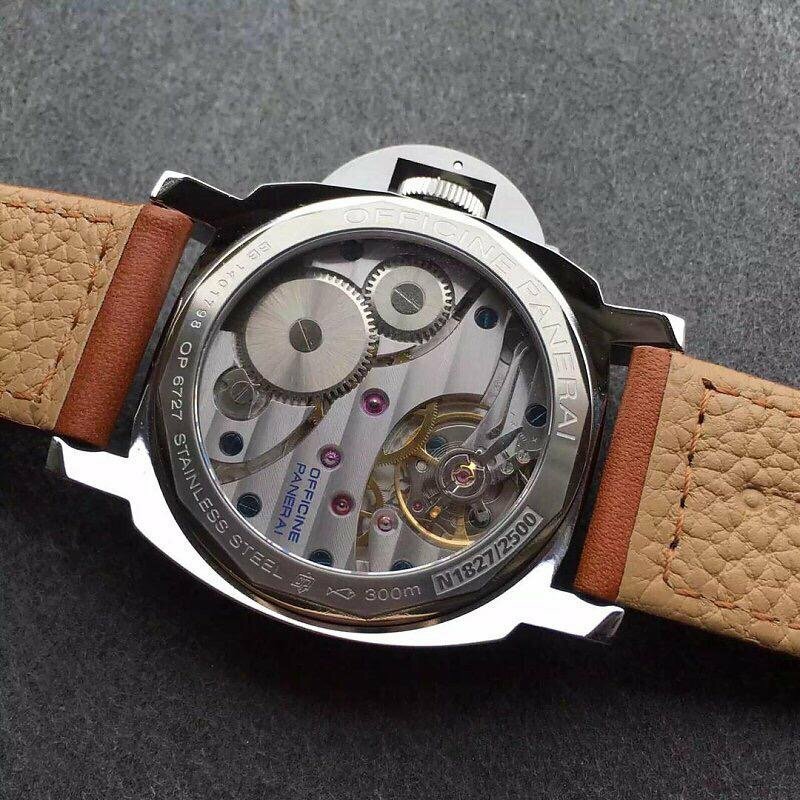 If you do not like its transparent case back, you can choose PAM 005, the quality is the same, I mean both are in top grade. 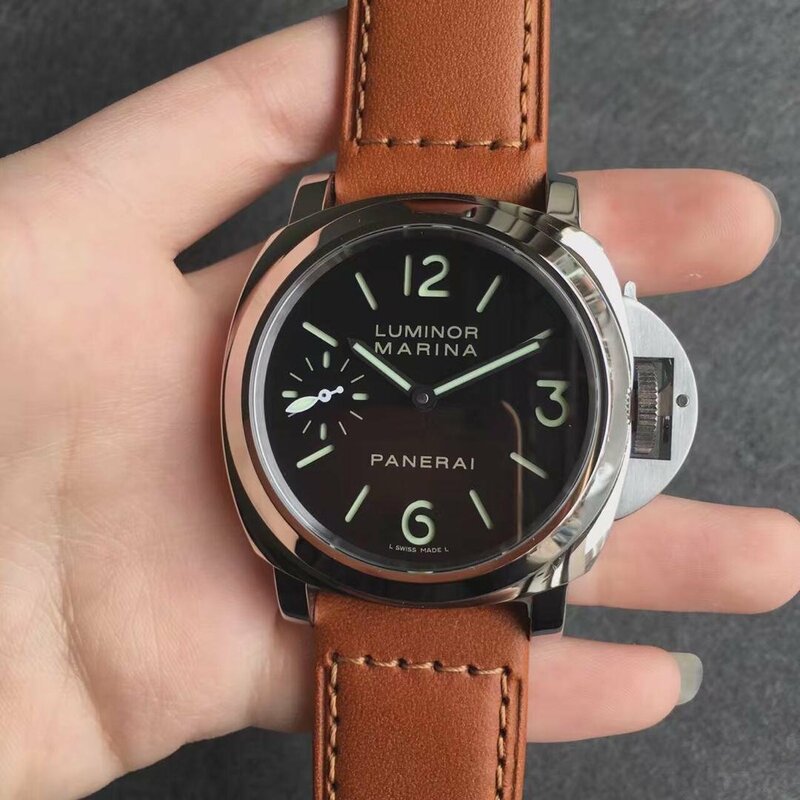 The series of luminor was one of classic product in Panerai. It was almost the good choice for successful man. It was really so nice. 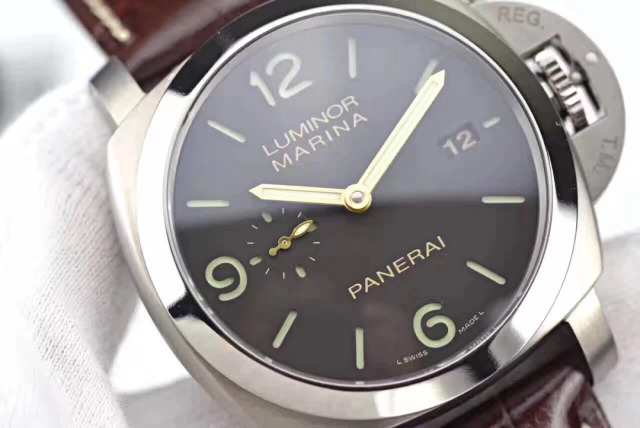 Today I am going to recommend an excellent replica Panerai luminor Marina Logo. It revealed masculine temperament of men. No matter its appearance or capability. It is no exaggeration to say that it is almost can instead of the original because it so similar with each other. This replica with a case which was made of solid 316F stainless steel, and has gone through the process of polishing. 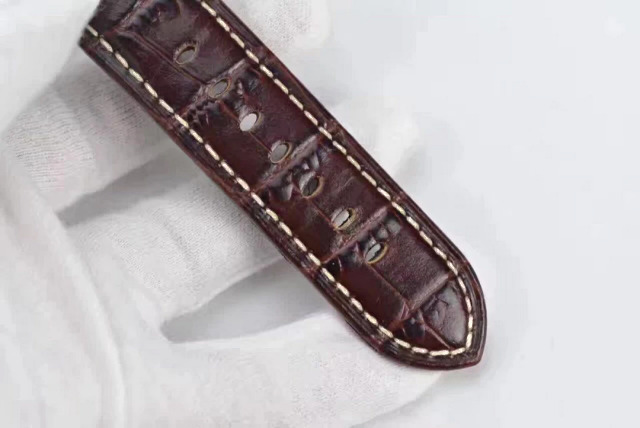 In addition, such hard steel material was used in most part of this wrist watch. Including its crown, buckle. So it may increase its weight in a way. It was fit for the taste who like automatic wrist watch. Its diameter was 44mm, such ultra big diameter was one characteristic of this series. Through its sapphire crystal, we can see that it has black sandwich dial with luminous hands and stick hour markers. And Arabia numerals mark at six ,three, twelve o’clock position. Small seconds sub-dial at the nine o’clock position. Anything about time information was so clear in the dial. For one thing, its crystal with colorless AR coating, for anther thing, super luminous has been used in markers, hands and sub-dial. So no matter in day or night, you can read time clearly. It was more suitable for outdoor fans as a whole. 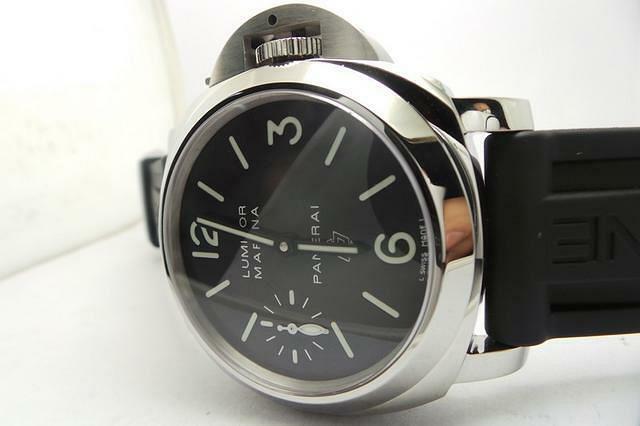 There are also has anther unique characteristic has been reflected in this replica Panerai. Its unique protected bridge of crown. 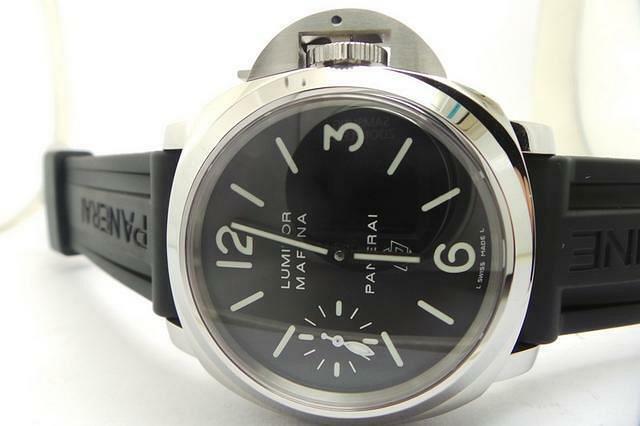 This design only can be seen in Panerai so far, so it was rather easy to recognize. The stainless steel crown was protected by lever. 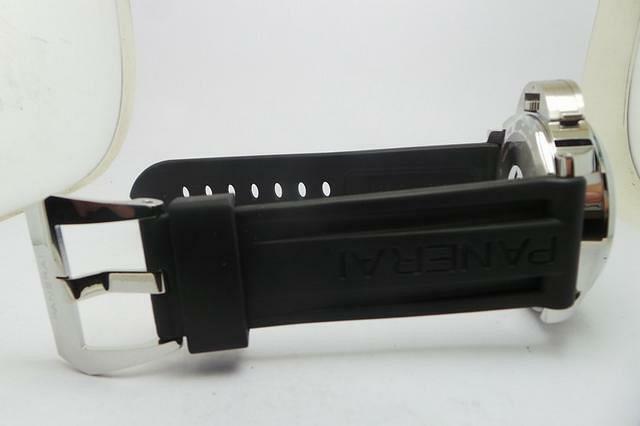 Such simple structure of lever can protect the wrist watch from water. So that it can has good performance in the function of water-resistance. What’s more, its solid steel case back also has this advantage. 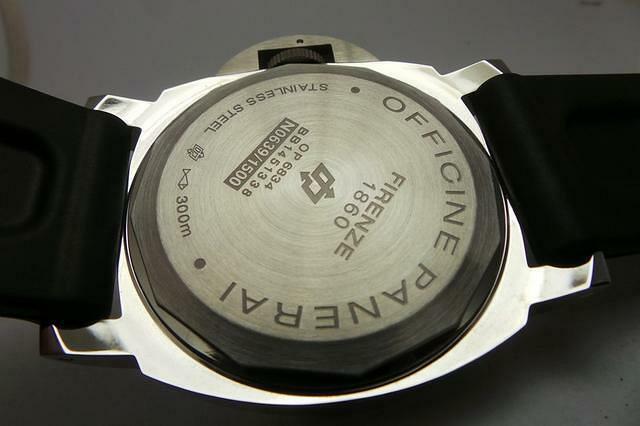 When observe the case back carefully, we will find that it has engraved “Officine Panerai” the same as genuine. 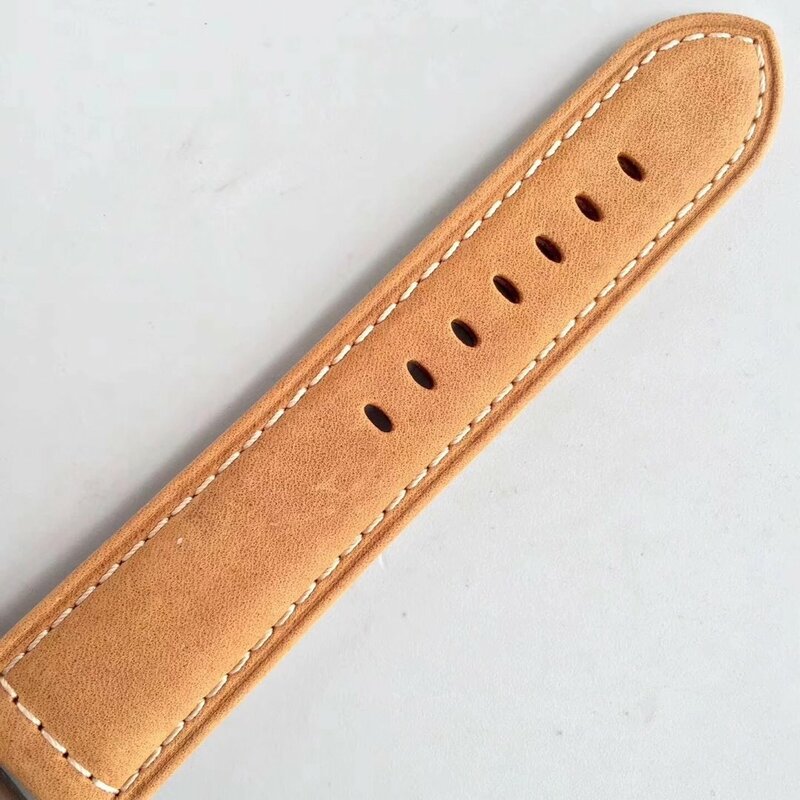 When we see its strap, this replica watch with a rubber strap which can be anti dust. Matched with polished steel buckle, it was more harmonious as a whole. Since it equipped with Asian 6497 Manual Hand-wind Movement, it was more precise and stable in travel time. With ultra big dial, unique protected bridge of crown, delicate and powerful super luminous, these three important characteristic has been highly copied in this replica with superior quality. I think it deserve you to buy.